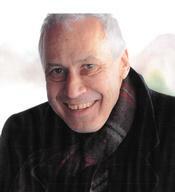 Clark Lake will miss George Svinicki, who passed away Sunday, October 6th. He will long be remembered by his family and many friends. As someone who was highly involved in our community, he will also be remembered for his leadership in Clark Lake projects and events in which he was involved. George Svinicki was the first chairperson of the Clark Lake Spirit Trail and was instrumental with its inception, design and construction. He was well prepared for this leadership role by virtue of his impressive professional background that had its beginning with a BS in engineering from U of M. He specialized in complete site/civil and building design of commercial and industrial projects. Commenting on George’s professional life, one Clark Lake resident, Ann Swain, said “George was responsible for some things in the Jackson area that stopped nothing short of amazing.” He operated Svinicki Associates, an architectural and civil/structural engineering practice for 30 years, a firm his father started in 1953. So, in George Svinicki, the Spirit Trail had a knowledgeable leader. 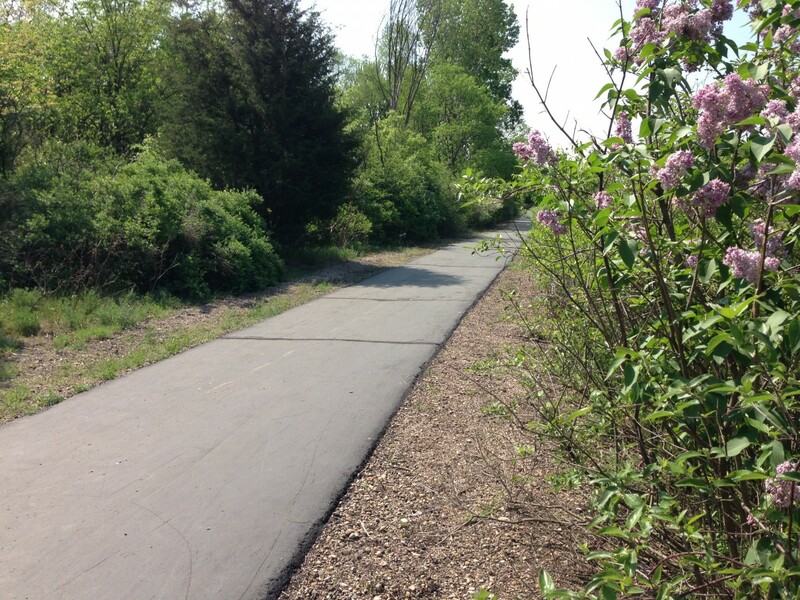 As its strong proponent, he was heavily involved with the building process in sections like these–through the County Park, the old railroad bed parallel to Hyde Road, and the connectors between Oakwood and S. Woodlands and S. Woodlands and Sandy Beach. George also organized the Trail’s first fundraiser about 15 years ago. It was a walk and bike ride from the Township Park to the Eagle’s Nest that culminated in a pig roast. No one was left out. A fellow Spirit Trail member said George ensured that means were provided so that the elderly could participate and even made sure “there were refreshments all along the way.” Without George Svinicki, today’s Spirit Trail would not be the model of excellence that it is. Clark Lake gets the Golden Gate Bridge! George was also a strong supporter of the Raft-O-Rama. Observers of the event will long remember the year the theme was “cities.” George and his crew, using two rafts, recreated the Golden Gate Bridge on Clark Lake! There is no doubt that George loved Raft-O-Rama as much as Clark Lake. The Spruce Goods and Howard Hughes! 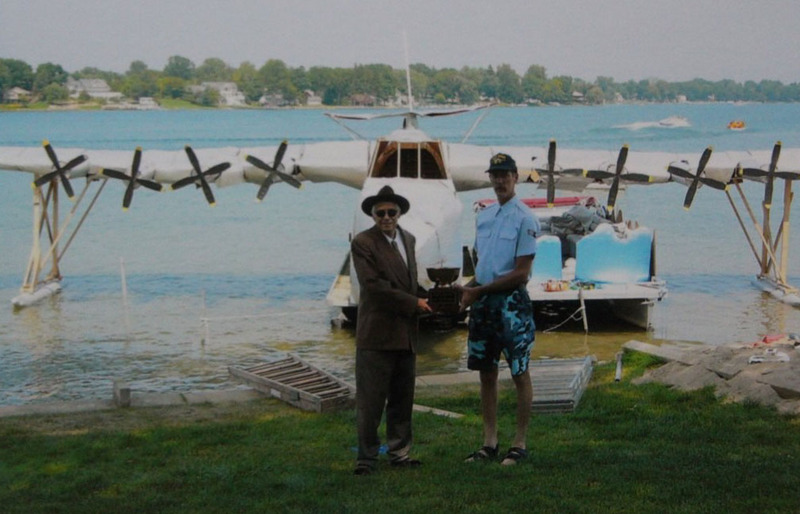 George Svinicki’s first Raft-O-Rama win was 1997, but the winning was only beginning. A fellow committee member described George’s entries as “awe-inspiring.” The year the theme was “transportation,” George’s entry was Howard Hughes’ enormous wooden airplane, called the Spruce Goose. Just like the actual plane, George’s Spruce Goose was huge! As the Spruce Goose launched from the Township Park, it could easily be seen from Eagle Point. And, no question, it was instantly recognizable as the Spruce Goose! The battle ship was not abducted. His enthusiasm was contagious. It led others also to engage their imaginations that in turn helped them create other remarkable entries. South Woodlands, where George Svinicki lived, was a hotbed of Raft-O-Rama activity. Competition was friendly, but intense–and not without intrigue. 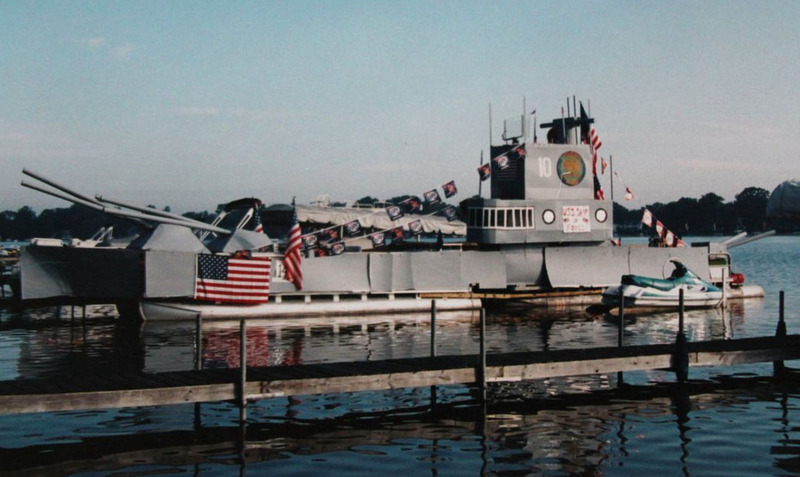 The year the theme was “board games,” the Svinicki team had created a battleship. The night before Raft-O-Rama, the finished entry was docked in front of their home. At 3 am a competing team, dressed in camouflage, attempted to spirit off the raft to hide it on the other side of Eagle Point. The conspirators then planned to assemble early in the morning to watch George’s reaction. But the deed was foiled in progress by George and his crew, and Clark Lake never got to see the shock on George’s face. Whatever ancillary games were played, there was no doubt that each team was in it to win. But for George, friendship trumped competition. Tucker Boyers tells how when the Boyers team won the Raft-O-Rama, George would be at his doorstop with a bottle of champagne to salute the victory; and Tucker returned the gesture when George was the winner. The Svinicki entry “Legends of Raft-O-Rama” before meeting with an unfortunate gust of wind. Friendship and caring were illustrated in another ways. Kathleen Kelleher Svinicki, George’s widow, tells the story of how that played out one year. 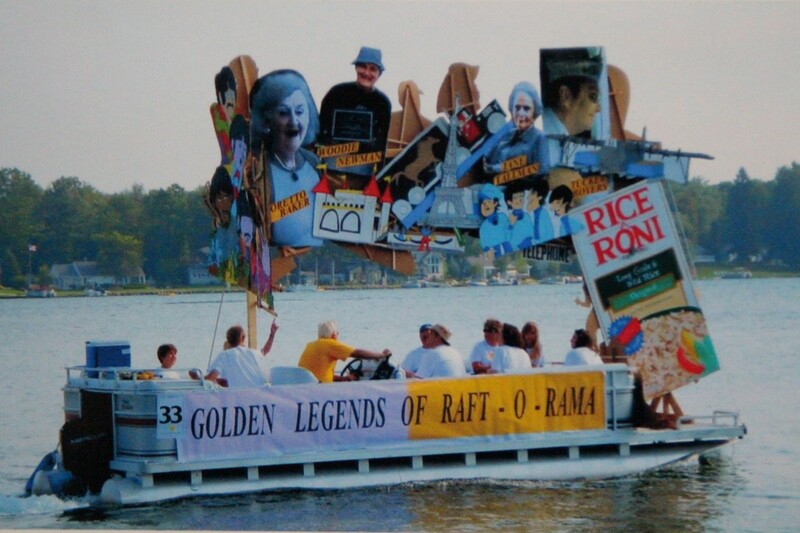 “Our 50th anniversary float was titled ‘Golden Legends of Raft-O-Rama’, another great idea that George came up with, to honor past ROR standouts. Photo images of the past winners were attached to a superstructure on the raft. When the winds hit the boat and the artwork hit the water, we all thought we were done for the day. “George quickly got everyone back on track. 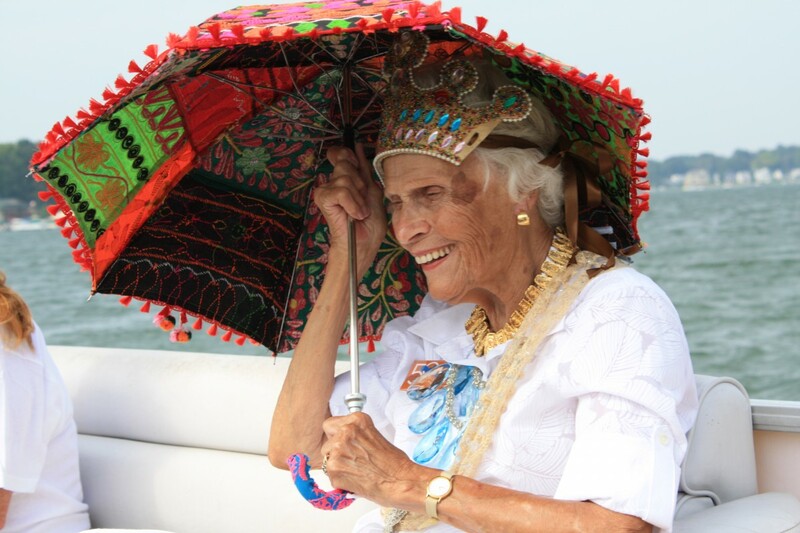 Jane Tallman was one of the legends and George knew she wanted to take one last trip around the lake. So he took the letter ‘S’ off the word Legends, placed Jane up front and center, and we paraded around the lake, as she gave the royal wave while holding onto her crown. Golden Legend Jane Tallman riding in a place of honor. “SHE was the Golden Legend of Raft O Rama! “George turned a freak accident into a tribute to a true living legend. A week later we visited Jane at home and presented her with an album of her big day. She thanked George for making her dream come true and told us all about the people she met at the chicken dinner whom she hadn’t seen in years. “In the end it wasn’t about winning, it was about sharing time with friends, making memories and riding around his beloved Clark Lake on a warm, sunny day. Two beautiful souls who are no longer with us, gave us a day we will always remember and a lesson we will never forget. RIP. Clark Lake is known for its Raft-O-Rama. And for his hard work, creativity and spirit, many will continue to be grateful to George! The degree of care for our community that George Svinicki expressed in friendships, expertise, leadership and advocacy can never be fully calculated. Although evidence of it may remain, his presence will be forever missed.